AX3051 is a wide input voltage, high efficiency ActiveCC step-down DC/DC AX3051 is a wide input voltage, high efficiency ActiveCC step-down DC/DC (Constant Output Current) mode. AX3051 consists of step-down switching regulator with PWM control. The device includes a reference voltage source, oscillation circuit, error amplifier, internal PMOS and etc. AX3051 provides low-ripple power, high efficiency, and excellent transient characteristics. The PWM control circuit is able to the duty ratio linearly forms 0 up to 90%. An over current protection and short circuit protection functions are built outside that it can set by a resistance. 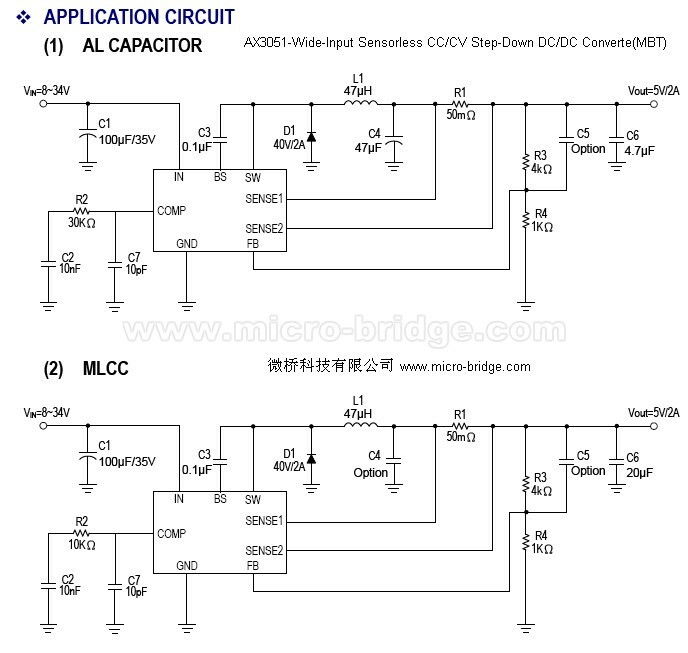 An external compensation is easily to system stable; the low ESR output capacitor can be used. With the addition of an internal N-channel Power MOS, a coil, capacitors, and a diode connected externally, these ICs can function as step-down switching regulators. They serve as ideal power supply units for portable devices when coupled with the SOP-8L and SOP-8L-EP packages, providing such outstanding features as low current consumption. Since this converter can accommodate an input voltage up to 40V, it is also suitable for the operation via an AC adapter. - Built-in internal SW N-channel MOS. - External current limit setting. - SOP-8L and SOP-8L-EP Pb-Free packages.